I had just come from an investment firm that is one of the world’s largest asset managers. I was meeting with a team of young corporate professionals who organize to do volunteer work. 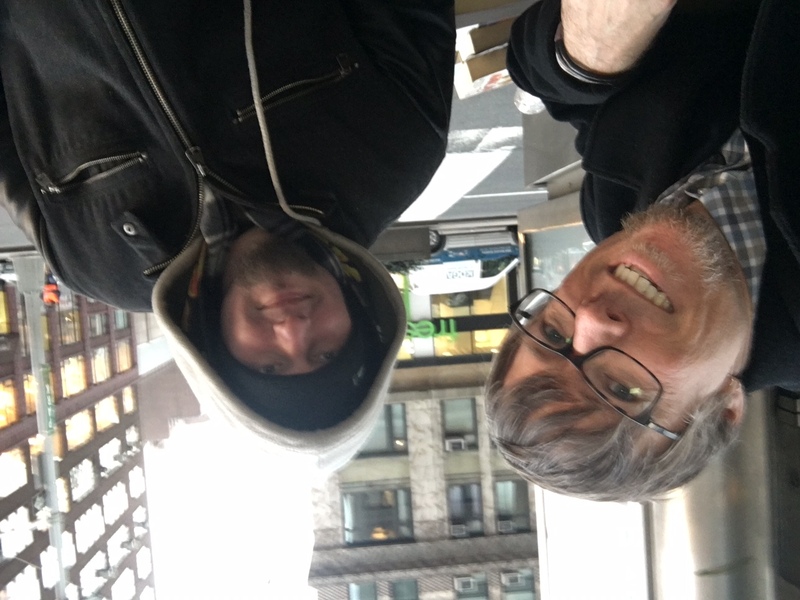 We talked about how their company could help the homeless through partnering with New York City Relief. This small team was fascinated by stories of what people are going through on the streets and to learn how they could make a difference. I crouched down to talk to Mike. His head hung low and his whole body seemed to be weighed down with the worries of the world. I asked him his name and then asked him if he was hungry. He said that he was okay. Mike is about 35-years-old and suffers from mental illness. His speech was quiet and broken- hard to discern. I asked him if I could pray for him and he immediately said yes. After praying, I asked Mike if I could buy his sign. His head came up quickly and he looked me in the eye for the first time as he said, “Yeah!” I asked how much and he replied, “Five dollars?” I thought it was a fair price and handed over the cash. I invited him to come visit The Relief Bus the next morning, but communication was pretty difficult and I’m not sure if he understood. 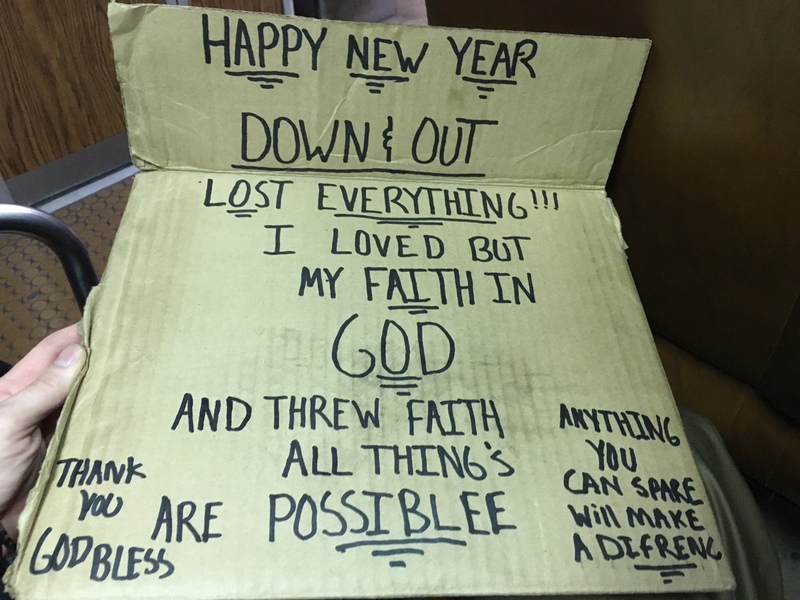 I got the idea for buying Mike’s sign from a video I had seen about an artist and Southern Methodist University advertising professor named Willie Baronet who had traveled across America buying the cardboard signs used by homeless people to ask for money. He’s bought hundreds of them, and he uses them in art exhibits and performances about homelessness and the concept of home. 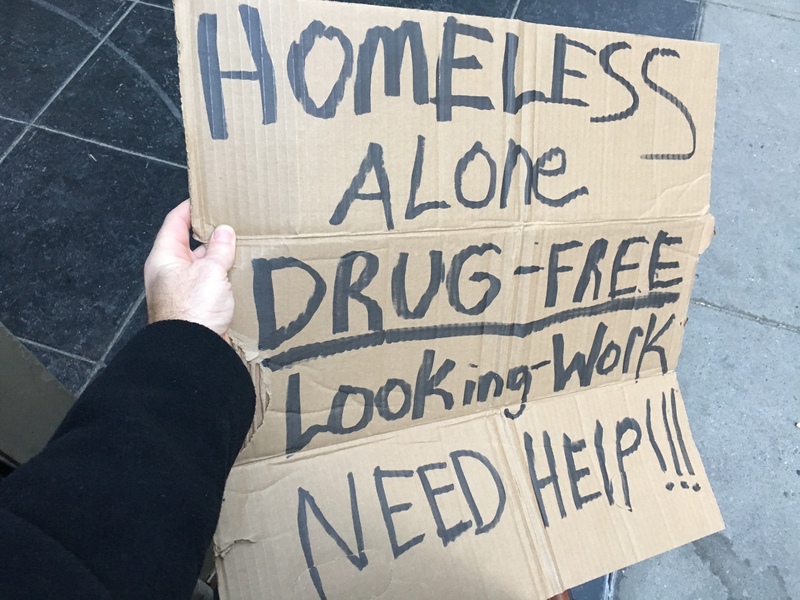 In New York City, I see people challenged with homelessness holding cardboard signs all the time. The messages are stark and heartbreaking. These signs remind me of the stories of lepers in the Middle East 2,000 years ago. Because they were contagious, these lepers were required to publicly warn people that they were coming by yelling out, “Unclean!”. Not only were they a potential spreader of a flesh-rotting disease, they carried the stigma of contaminating other’s spiritual condition. The Old Testament law prevented God-fearing Jews from going near lepers for fear of tainting their spiritual purity. Lepers were the epitome of the term social pariah. I crouched down again and asked James his name. He was friendly and talkative. I told him about The Relief Bus and he was very interested in paying a visit to receive help. I asked James if he would sell me his sign. He also responded positively and gave me a higher price- $20. With a smile I said, “Twenty dollars huh? That’s quite a bit.” James replied that he came to that price because that would give him enough to get a bed that night, instead of sleeping on the street. He was very articulate and descriptive about the place he would stay. All of a sudden, that sign looked like a great deal. We also prayed together and even took a selfie (above). That’s what friends do together. It felt better buying the signs from these men, rather than just giving some cash. It felt like there was more dignity in exchanging money for the items rather than giving a handout. I now have these signs hanging in my office to remind me of Mike and James, so that I don’t forget to pray for them and the many other people experiencing homeless who God loves just as much as he loves me. Meeting with the rich and poor in the same day is a bit of a shock to the system and very thought provoking. I find that both the rich and the poor are demonized. The rich are stereotyped as uncaring and arrogant while the poor are stereotyped as lazy and irresponsible. Although sometimes true, I find that neither stereotype fits the majority of the people that I know. The rich and the poor shake hands as equals— God made them both! Let me give you a little challenge and some solid investment advice for 2016. Instead of ignoring or even judging the beggar you see sitting on the sidewalk, why not purchase yourself a cardboard sign? You just might find a new friend to help carry your load.